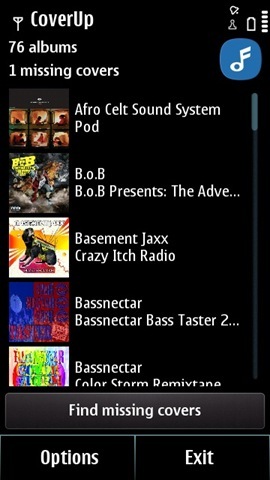 CoverUp makes it easy to find and download album covers for all the music on your device. The first time you launch CoverUp, the music library is scanned for albums. If you have a lot of music on your device, this can take time. 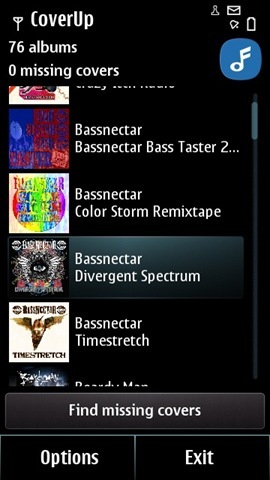 When the scan has completed, you will see a list of all the albums on your device, and there covers if they have any. To automatically find covers for your music, just press the “Find missing covers” button. 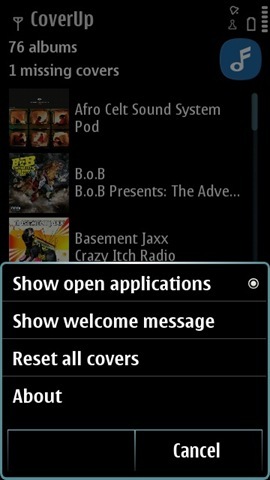 Once the action finishes, open the music player to see that covers have been added. Note that on some devices you may need to exit and restart the music player or even restart the device to see the new covers. For some albums, the automatic method may not work. 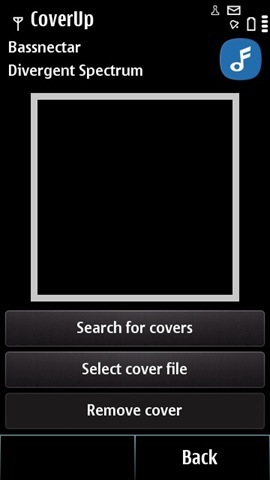 CoverUp allows you to manually search for covers, and to set a cover to a picture already saved to your device. 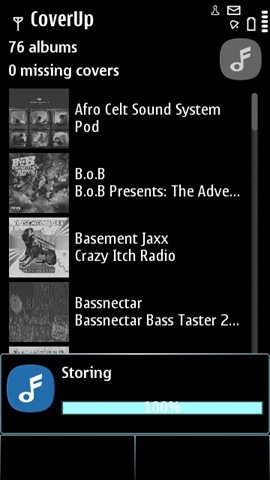 To access these manual options, just tap on an album in the list. To expand on this, trying out this app reminded me that the best apps are often the simplest and most intuitive to use and I am happy to say that this is one of them. On first time operation of the CoverUp a “Finding covers” overay appears at the bottom of the screen with a progress bar advising the user of percentage progress through the scanning of all music on the device (I have not verified if this is limited to the Music folder or not). After the scan is complete the number of albums found and the number of missing covers is listed at the top of the screen with a list of all albums with their related, found, album cover art displayed next to them. The one negative I have noted is that there is no filter to guide the user to the albums with missing cover art. Instead you have to scroll through the list to find the album with a sad face instead of cover art. Show welcome screen – providing the advisory text I quoted earlier. About – providing information on the app version and the developer. Select cover file – opening a file browser to select the name of the desired cover art file name with an obligatory “Cancel” button if you change your mind (see right hand image below). 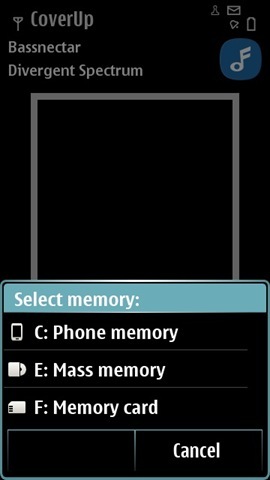 Below these buttons is a simple “Back” button in left hand location in the standard button bar which returns to the user to the main app screen. Once back on the main app screen the number of “missing covers” is live updated based on any recent activity (see centre image below). Finally when all desired changes are made and the “Exit” button is pressed a “Saving” progress bar overlay is displayed independent of if any changes have been made (see right hand image above). Although CoverUp is not a free app its £3 price tag is well worth it if you are like me and dislike having music without artwork. I realise this app will not change the world, but it is the little things that add up to make the great user experience that we are all after.